We have written up a few ideas that we think may help with your luminaria. You may have a few of your own; if so, please give us your suggestions and we would be happy to add them to our list. These are just suggestions. Please use the ones you like and disregard the others. To include your whole neighborhood in the luminary project, send a letter to everyone explaining the project and give them details on how to order or how to participate. We have a sample neighborhood letter you can use as a starting point. Our sample letter is for a Christmas event, but you can easily use the same idea for organizing a Halloween event. Create Block Captains or Street Captains - This	person could be in charge of their own particular street or block. Depending upon your situation, they could be responsible for taking	orders, distribution of the luminary / candle kits, or supplying sand. Regardless of whether you use bags or cups, sand is needed for every luminary. Sand for your neighborhood should be put	in a neutral spot so it is available for everyone (you should figure 1 yd. of sand per 1000	candles). Bags should be folded at the top to eliminate flapping. Everyone should be responsible for folding their own bags, or better yet, organize a bag folding party in your neighborhood! Bags should be placed anywhere from 3' to 10' apart. This is up to you as a neighborhood to decide. Whatever the decision is, you should be consistent throughout the neighborhood. 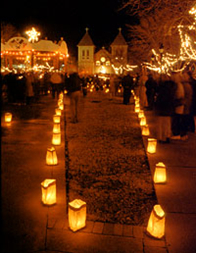 We recommend our long burning candles for luminaria so	they will burn late into the night. That way, you may still enjoy the beauty even if you are late	returning from a Christmas party or another social event. Use our votive cups to attain maximum burn life. You should use about 2 inches of sand in each bag. If you use a votive cup (highly recommended), you will need a lot less sand and your candles will burn longer. See our Assembling Luminaries page for a helpful diagram. Kids enjoy being included in your luminary project. Let them do a simple task, like putting sand or votive cups and candles into the bag or cup. See the next hint which will help the kids put a consistent amount of sand into each luminaria. Instead of having each person guess how much sand to put into each bag (guessing means wasting), make one "master" example of a complete luminaria to serve as the standard measurement of sand. Next, pour this sand into a large plastic cup (like a stadium cup you get at ballgames) and mark the height of the sand around the outside of the cup with a Sharpie or a magic marker, along the circumference. With a pair of sharp kitchen shears or scissors, cut along the line you just drew. Now you have the perfect "sand measurer" to use when putting sand in the luminary bags. If you make multiple sand measurers like this, several people can put sand into the bags or cups at a time. Most candles are lit right before dusk. Depending upon the number of helpers, you should remember it takes a while to light your candles. After all, you will start having traffic at dusk - whether you are ready or not! We recommend you use grill lighters to light your luminaria. The long neck makes it easier to light the candle inside the bag or cup; plus, there's less likelihood of burning your fingers and you won't have to bend down so much. Be sure to raise the wick on each candle prior to lighting. Looking to stretch your budget? You can save sand from year to year and use it over and over again, so long as you have a dry place to store it between uses. One downside to saving sand is that twigs or dribbles of wax can contaminate your sand. There's a simple way to clean the sand before storing it - simply "screen" it by pouring your sand through a homemade box screen. Lastly, consider what the weather will be doing on the night of your luminaria project. If rain is forecast and you are using paper bags, it can make for a messy cleanup the next day. Consider using plastic luminary cups instead... they can be used again.